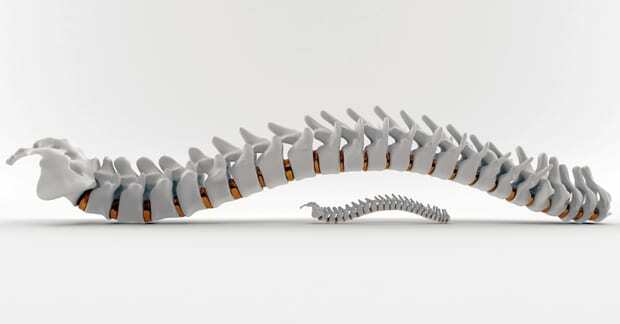 Spondylolisthesis - What Is That? Abigail was competing in a gymnastics tournament last year and during one of her floor routines, noticed a sharp pain in her low back after performing a series of back hand springs. She said she landed crooked on the last one which resulted in immediate pain in the middle of the low back at the belt line. She has had pain in the low back before and initially didn’t think this was any different from past episodes; however, when the pain didn’t improve after a week, she asked her parents if she could see their chiropractor for an adjustment. Her chiropractor took her history and was alerted by the mechanism of injury – the rapid onset of pain after bending backwards and landing crooked during her routine. The lower back was carefully examined and during the range of motion testing, Abby’s backward bending test resulted in both pain and limited motion. When bending backwards at an angle with pressure applied in the low back, sharp pain stopped the test immediately. Her neurological tests were normal and she could bend over and touch her toes – in fact, that felt good. Her chiropractor had a strong suspicion of what had happened and ordered an x-ray to see if the preliminary diagnosis was accurate. The x-rays looked normal but with the history of extreme backward bending and immediate pain onset, a bone scan was ordered which was positive for a stress fracture in the back part of the vertebra. Unfortunately, this meant no gymnastics for three months and the use of a low back brace. The good news is that the back pain was gone within a month and follow-up x-rays three months later did not reveal a visible fracture line in the vertebra. Abby was able to resume gymnastics and competed with success and no low back pain. So, what is spondylolistesis? As depicted in the side view low back x-ray above, it is the sliding forward of one vertebra over another (see arrow). It occurs in about 7% of the Western population and up to 30-50% in cultures that carry their young on their back (like a back pack). It is reported that most people who develop spondylolisthesis acquire this between ages 6 and 16 due to a developmental weakness in that part of the spine, though the cause can be traumatic, like in Abby’s case where rapid, uncontrolled backward bending occurred. It can also gradually occur over time (called “degenerative”), mostly in patients older than 50-60 years of age, where no single event can be recalled by the patient. There is also a congenital type that can be hereditary where one is born with it, though most authorities feel it is acquired at an early age. The good news is that it is often stable and does not require surgery. In the more severe case, the nerves and/or spinal cord can get pinched in which case surgery is necessary. The symptoms would then include leg pain, weakness, and/or numbness with or without significant low back pain. However, most cases can be successfully managed without surgery and do not compromise the nerves or cord. Chiropractic has been found to be very successful in managing patients with spondylolisthesis as the pain generator is often above or below the slipped vertebra. In fact, in one report, chiropractic was found to be more beneficial than medical care for this condition (Mierau D, et.al., J Manip Physiol Therap 1987;10:49-55).